How do we get as many people as possible involved in our mission: defending the universal right to reliable information – wherever you live. Over the course of 2016 we reorganised and expanded our communication and fundraising department, to further hone our communications with our support base and the general public. A number of new people joined the team: a marketing and fundraising specialist, a press officer and a colleague who will be handling online communications. In the year ahead, we will also be formulating a new communication strategy within the framework of Free Press Unlimited’s new long-term strategy. In 2016, we anticipated this development with a more distinctive positioning of our organisation and the further development of our house style. This gives the general public a clear idea of Free Press Unlimited’s ambitions and activities. Free Press Unlimited wishes to make as many people as possible aware of the importance of press freedom. In 2016, the Dutch broadcasting organisation VARA presented the documentary series ‘De pen en het zwaard’ (‘The Pen and the Sword’), in which the journalist Fidan Ekiz showed the precarious existence of independent journalists, newspapers and television stations working in dictatorships and conflict areas. These documentaries were possible in part thanks to our support. In 2016, Free Press Unlimited drew public attention to press freedom and how it regularly comes under fire – sometimes in the most literal sense – through two large-scale events. On 3 May, we took part in the Festival of Free Speech, where we launched the annual Press Freedom Monitor in the sold-out venue of Amsterdam’s De Balie. This new annual monitor tracks the state of press freedom and safe working conditions for journalists in countries around the world. Free Press Unlimited pointed out that the freedom of the press is coming under increasing pressure within the EU too. We called on European governments to guarantee the independence of Europe’s media by law. The EU needs to explicitly require candidate members to safeguard press freedom, as well as enforce this requirement in existing member states. 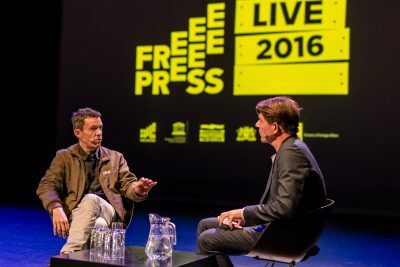 Six months later, on 2 November, some 230 journalists, legislators and policy-makers came together in De Nieuwe Regentes in The Hague for the event Free Press Live 2016. In a panel discussion moderated by Twan Huys, journalists, legislators and policy-makers talked about impunity and growing violence against journalists. The attendees were particularly impressed by the accounts of Can Dündar and Javier Espinosa. Dündar, the former Editor-in-Chief of the Turkish daily Cumhuriyet, narrowly survived an assassination attempt and was sentenced to five years in prison for ‘leaking state secrets’. Espinosa, who works as a journalist for the Spanish newspaper El Mundo, was held captive in Aleppo for over six months by ISIS. We regularly place informative advertisements in Villamedia, which is published by the Dutch journalists’ union NVJ, and sporadically in other publications like Broadcast Magazine. Every month, we send out a Dutch-language email newsletter to over 4,000 subscribers, as an English-language version to over 500 subscribers. The latter group consists of a mix of foreign partners, donors, fellow alliance members and media organisations. In 2016, we informed the recipients about our events, our Annual Report and the expanded scope of the Postcode Loterij Fund. We invited our subscribers to nominate candidates for the Awards that would be presented during Free Press Live. In addition, we invited the participants in our events to offer feedback. In 2016, our supporters also participated in a number of campaigns. Among other things, they signed our petition against the new bill authorising large-scale wiretapping by the secret services (via data trawling). People who make a one-off donation receive a paper newsletter by post twice a year. In this newsletter, we also ask them to make another donation or to become a Friend of Free Press Unlimited. In a ‘paper’ survey among some 600 donors and Friends, we asked these supporters which Free Press Unlimited themes appealed most to them: journalism in conflict areas proved a particularly ‘popular’ focus area. In addition, we inquired about their interest in possible tax-exempt donations and bequests. We don’t rely on a call centre to communicate with our donors: our team member responsible for private donations phones supporters in person to thank them for their support. In 2016, we saw a substantial increase in our number of followers on various social media platforms. On Twitter, our followers increased by 820 to a total of 5,760; while on LinkedIn, we presently have 840 followers – an increase of 260. Free Press Unlimited has 15,200 Facebook friends – 3,000 more than last year. In 2016, our YouTube videos were watched 9,870 times – a substantially lower number than in 2015 (14,330 times). In contrast, our website recorded a strong increase in visits – from 77,360 in 2015 to 133,150 in 2016. Free Press Unlimited has set up a complaints mechanism for its stakeholders, which complies with ISO 9001 certification requirements. The procedure includes a protocol that all our members of staff need to adhere to. Our basic point of departure is that whenever we receive a complaint at Free Press Unlimited, something must have gone wrong at our end. Each complaint is settled and registered as soon as possible – but in any case within 14 days of its submission. If the party that lodged a complaint is not satisfied with how it has been settled, it is free to appeal to the Board of Directors of Free Press Unlimited. Once again, Free Press Unlimited is obliged to respond to the appeal within a term of 14 days. At any given time, a party that has lodged a complaint can contact Free Press Unlimited for information about its settlement.